Following the Thanksgiving holiday, Apple Store shipping estimates for both the iPhone 6 and the iPhone 6 Plus have seen significant improvement, with many models in the online Apple Store now carrying a shipping estimate of 3 to 5 days in the United States. iPhone 6 and iPhone 6 Plus models in all colors and from all carriers in 16 and 64GB configurations now ship within 3 to 5 days, while the more constrained 128GB versions ship within 7 to 10 days. Though the iPhone 6 and the iPhone 6 Plus have been severely constrained since their September debut, Apple has been working hard to improve supplies. The company has reportedly delayed mass production on the iPad Pro to focus on producing more iPhone 6 Plus units, a move that's bolstered available supply. iPhone 6 and 6 Plus stock first began improving in late November, with 16GB iPhone 6 Plus supplies jumping to a 7 to 10 day shipping estimate after sitting at three to four week shipping estimates for several weeks. 64GB and 128GB iPhone 6 Plus devices have seen the biggest increase in supply, because as of late November, 64GB devices carried a shipping estimate of 2 to 3 weeks while 128GB devices carried a shipping estimate of 3 to 4 weeks. 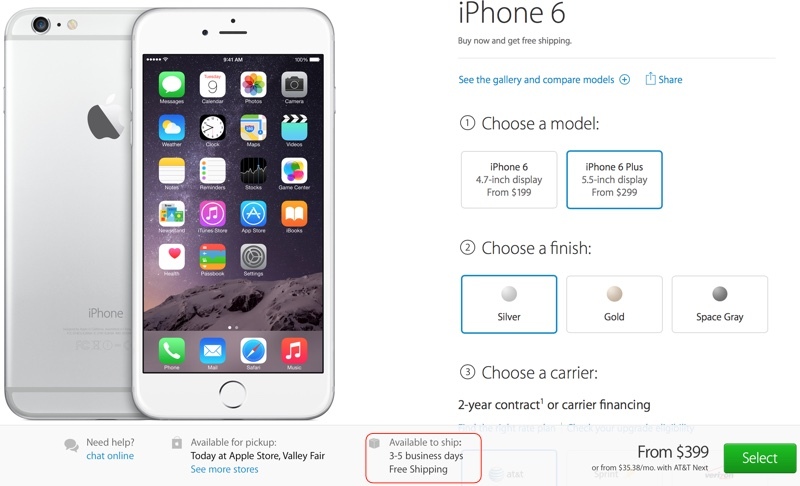 iPhone 6 supply has also been steadily improving, going from 7 to 10 days in November to 3 to 5 days today. In store supply of the iPhone 6 and the iPhone 6 Plus has also seen significant improvement, and many stores across the country list availability of both the iPhone 6 and iPhone 6 Plus in 16, 64, and 128GB configurations. 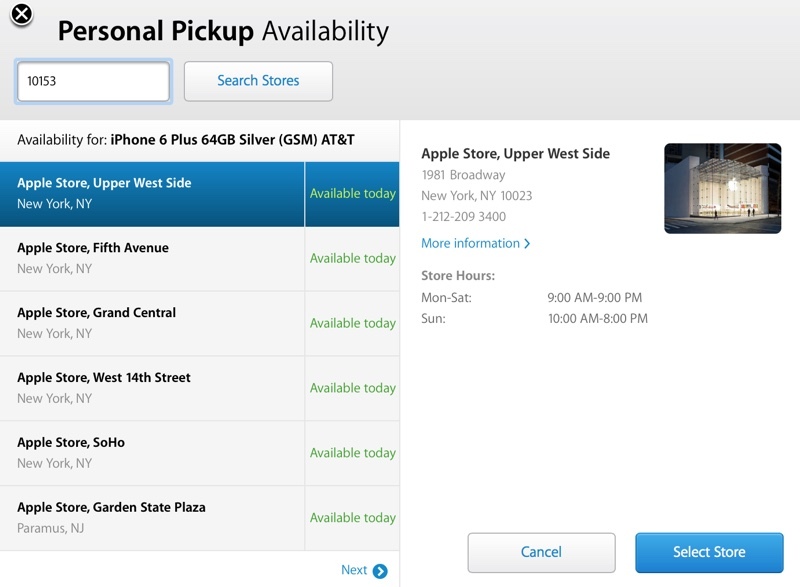 Tracking tool iStockNow can be used to find where iPhone 6 and 6 Plus devices are available. During Apple's fourth quarter earnings call on October 20, Apple CEO Tim Cook said that demand for the iPhone 6 and 6 Plus was "far outstripping" supply and that the company was "not close" to having a supply/demand balance at that time, but based on the improved shipping times, the company could come close to meeting its supply goals before the end of the year. Me: "Hey, do you have a 16 gb iPhone 6 in stock." Sprint person: "Yes, you made it just in time. We have about 3 left." At this point you should just wait for the 6s. I feel sorry for anyone who actually bought the 16GB model. That's what happens when 60 million people try to buy 30 million iPhones. You're gonna have to wait! It's estimated that Apple is producing 600,000 iPhones every single day. And it's still not enough. Other companies can only dream of having that "problem"
At this point, I would wait for the 7. You do realize that all iPhones in the Apple store are unlocked? Locking is part of the carrier activation process to check if they "own" the iPhone as part of a contract. Anyways, it's good to hear that it only takes 3-5 days to get a damn phone for those lucky enough not to have a business phone plan. You could always just buy the iPhone full price from Apple and insert the AT&T SIM. That's what I'm waiting for. The 6+ will hold me over until then. What worries me about this kind of "improvements" in shipping is that Apple is probably producing so much iphones so quickly that the chances of getting a faulty device is extremely likely. Extremely likely? Remind me never to be on an airplane with you. You'd be yelling so loud about the chances of a mid-air collision that I wouldn't be able to sleep.